Renting cheap rooms from Airbnb's community? Old and busted. The new hotness, at least if you have a few tens of thousands to throw around: Renting villages or even an entire country. Thanks to a partnership with Liechtenstein-based event production company Xnet, Airbnb is now offering to rent out villages in Germany, Austria, or Switzerland for $50,000-$65,000 per night. 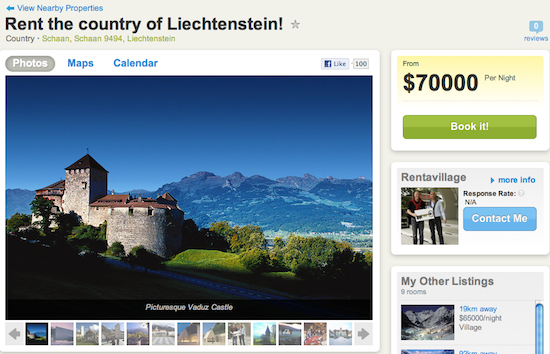 But high rollers will probably want to up their game and rent all of Liechtenstein, an independent nation with a population of 35,000. The price tag: $70,000 a night for a minimum of two nights. Here's the listing. What does that mean exactly? Will the Liechtensteiners throw off the yoke of oppression? It's a little less drastic than it sounds.